Look at the epinephrine example in your text. That hormone can trigger different responses in different target cells. Epinephrine can trigger vasodilation responses (blood vessels in skeletal muscles used for fight-or-flight) and vasoconstriction responses (gut vasculature) in an emergency that evokes its secretion. Steroid and peptide hormones typically have in common _____. Calculate the volume of blood moved per minute by a heart at rest. A heart "at rest" beats at a rate of 72 beats per minute and moves 70 milliliters (mL) of blood per beat. When the heart is stimulated by epinephrine (the fight or flight hormone), the heart rate doubles and the volume of blood moved per beat triples. Calculate the volume of blood moved per minute by a heart that has been stimulated by epinephrine. The heart rate at rest is 72 beats per minute. Stimulation with epinephrine doubles the heart rate to 144 beats per minute. The blood volume moved per beat at rest is 70 mL. Stimulation with epinephrine triples the volume moved per beat to 210 mL. How much more blood does the heart move in a minute when stimulated compared to at rest? What is the percent increase in blood flow due to stimulation? A 500% increase means that 5 times more blood is pumped when the heart is stimulated by epinephrine than when it is at rest. Since nonsteroid hormones do not cross a cell's plasma membrane, their receptors are located in association with the plasma membrane. Both epinephrine and oxytocin are nonsteroid hormones. Since they do not enter the cell, nonsteroid hormones act via signal transduction pathways. Steroid hormones such as estrogen can diffuse through the plasma membrane and bind to intracellular receptors. This is the primary reason that steroid hormones usually act slowly. Steroid hormone-receptor complexes bind to DNA, where they affect transcription. A. Steroid hormones can act in very small concentrations and very few molecules of steroids need to cross the lipid bilayer. B. Steroid hormones are lipid soluble and easily cross the phospholipid bilayer. C. Steroid hormones act on cells close to where they were produced and very few molecules are required to travel such a short distance to cross the lipid bilayer. D. Steroid hormones act on the same cells in which they are produced and, therefore, are within the cell they are acting upon. Growth factors are local regulators that _____. An animal’s body maintains a relatively constant internal environment. How is this accomplished? It is surprisingly similar to the way a thermostat and heating system maintain a relatively constant temperature inside a room. 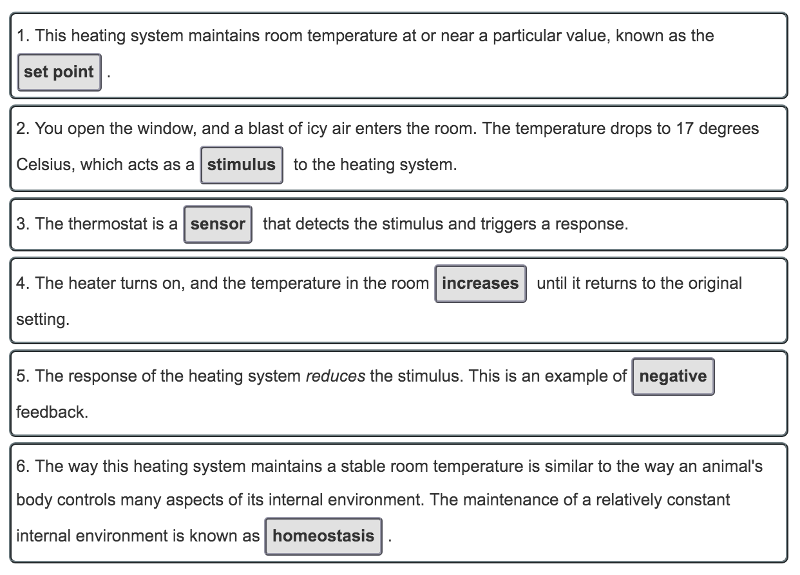 Drag the terms on the left to the appropriate blanks on the right to complete the sentences. Not all terms will be used. The maintenance of a relatively constant internal environment is known as homeostasis. To achieve homeostasis, the body has a wide variety of sensors that detect and trigger responses to different stimuli. Negative feedback, in which the body’s response reduces the stimulus, is an important mechanism for maintaining homeostasis. In the animation, you saw that both high blood glucose levels and low blood glucose levels are stimuli that trigger specific responses by the body. These responses cause blood glucose levels to return to their normal range. In this activity, you will explore how this happens. Drag the labels to their appropriate locations on the diagram. Insulin and glucagon act together to maintain homeostasis of blood glucose levels. When blood glucose levels rise, insulin is released. Insulin causes the liver to take up glucose and convert it to glycogen. Insulin also causes most cells in the body to take up glucose. As a result, blood glucose returns to its normal range. When blood glucose levels fall, glucagon is released. Glucagon causes the liver to break down glycogen and release glucose into the blood. As a result, blood glucose returns to its normal range. In the disorder diabetes mellitus, the body is unable to maintain homeostasis of blood glucose. There are two major types of diabetes, type 1 and type 2. 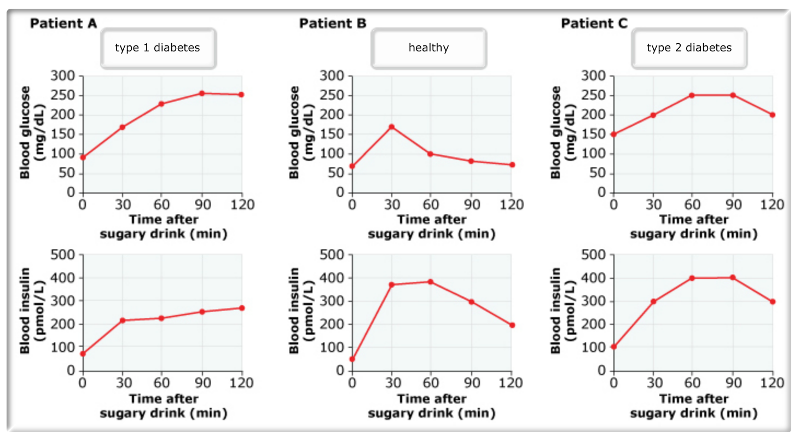 The graphs below show blood levels of glucose and insulin in three patients after each has consumed a sugary soft drink. Use the graphs to identify which patient is healthy, which has type 1 diabetes, and which has type 2 diabetes. Drag the labels to their appropriate locations above the graphs. In people with diabetes mellitus, the body is unable to maintain homeostasis of blood glucose. In type 1 diabetes, the immune system destroys most of the beta cells of the pancreas. Little or no insulin is produced. As a result, blood glucose levels remain elevated for a longer period than in healthy individuals. In type 2 diabetes, the pancreas produces sufficient insulin. However, the body's target cells do not respond to insulin effectively. As a result, blood glucose levels remain elevated for a longer period than in healthy individuals. Because glucose levels remain high, the pancreas continues to release insulin -- this is why insulin levels are also higher than in healthy individuals. Chronic disruption of glucose homeostasis has serious effects, particularly for the heart, blood vessels, kidneys, and eyes. In the U.S., diabetes is a major cause of blindness and the seventh most common cause of death. When the beta cells of the pancreas release insulin into the blood, _____. The milk-release response system was given as an example of a neuroendocrine pathway with positive feedback leading to milk release from the nursing mother to the sucking baby. The "neuro" part includes the baby's activation of the mother's mechanoreceptor neurons in the breast. The anterior and posterior lobes of the pituitary differ in that _____. Anterior pituitary hormones FSH and LH (ovaries and testes), TSH (thyroid), and ACTH (adrenal cortex) stimulate endocrine glands; posterior pituitary hormones ADH (kidney tubules) and oxytocin (mammary glands, uterine tissues, brain) regulate nonendocrine tissues. Hormones secreted by the posterior pituitary gland are made in the _____. Injury localized to the hypothalamus would most likely disrupt _____. Portal blood vessels connect two capillary beds found in the _____. The body's reaction to PTH (parathyroid hormone), raising plasma levels of calcium, can be opposed by _____. DES is called an "endocrine disrupting chemical" because it structurally resembles, and interferes with, the endocrine secretions of the _____. Of the following types of molecules, which can function as both neurotransmitters and hormones? The hypothalamus secretes both releasing and inhibiting hormones. These hormones, secreted by the adrenal medulla, are responsible for the "fight or flight" response. In response to stress, ACTH stimulates the adrenal cortex to secrete glucocorticoids. _____ are the main male hormones. Androgens, such as testosterone, are the main male hormones. What hormone promotes water retention by the kidneys? A diuretic promotes water loss; thus it makes sense that ADH (secreted by the anterior pituitary) promotes water conservation. Which hormone opposes the action of parathyroid hormone? Parathyroid hormone increases blood calcium levels; calcitonin lowers blood calcium levels. Which hormone stimulates hormone production by the ovaries and testes? LH stimulates hormone production by both the ovaries and testes. Prolactin, secreted by the anterior pituitary, stimulates milk production by the mammary glands. Jet lag occurs when a person moves rapidly from one time zone to another, causing conflict between the body's biological rhythm and the new cycle of light and dark. Some scientists suspect that jet lag may result from disruption of the daily cycle of secretion of the hormone known as _____. Melatonin is produced by the pineal gland, but only at night; its production is regulated to some extent by day length. People with type II diabetes mellitus have defective insulin receptors that cannot respond to insulin properly. Relative to normal individuals, what would be the effect on blood glucose levels under conditions of chronic stress that kept blood cortisol levels high? There would be _____. In an experiment, rats' ovaries were removed immediately after impregnation and then the rats were divided into two groups. Treatments and results are summarized in the table above. The results most likely occurred because progesterone exerts an effect on the _____. Vertebrates have two major communication and control systems: the endocrine system and the nervous system. 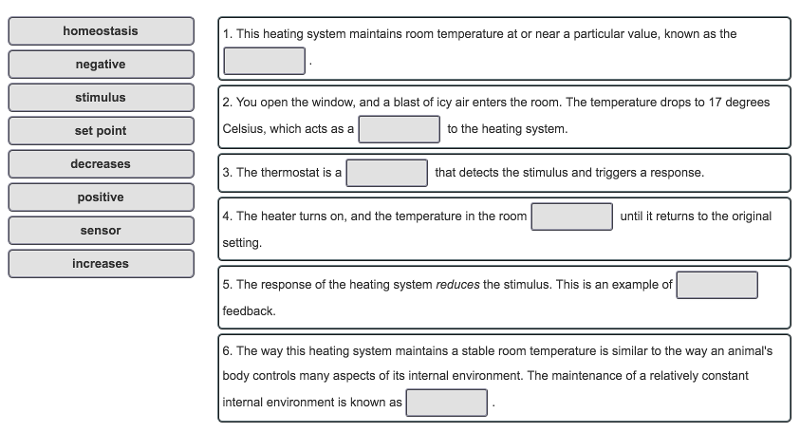 Choose the correct statement describing the coordination of these systems. A. Epinephrine functions as a hormone in the endocrine system and as a neurotransmitter in the nervous system. B. The parathryroid gland is a fused endocrine and neuroendocrine gland. C. The adrenal cortex secretes hormones in response to nervous stimulation. The same is true of norepinephrine. Read about adrenal hormones. 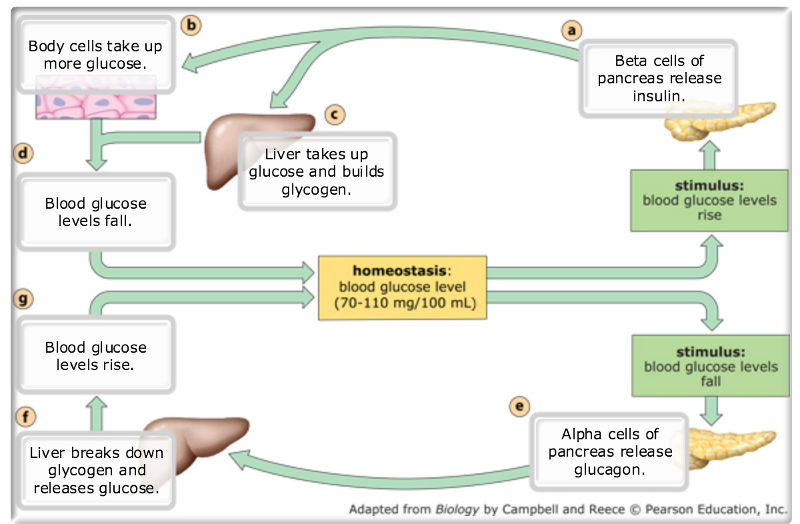 Glucose homeostasis is maintained by two antagonistic hormones, insulin and glucagon. Select the correct statement about these hormones. A. Each of these hormones operates in a simple neuroendocrine pathway. B. Each of these hormones operates in a simple endocrine pathway. C. The two hormones interact in a hormone cascade pathway. Read about simple hormone pathways and control of blood glucose.